Step one: What do you want to store? Step two: How much visibility is required of the items as they are stored? Step three: Will their use be heavy and demanding like an industrial application or frequent and light more like a school application? Storage lockers come in a wide variety of shapes, internal options, construction materials, and configurations. We can assist you in determining which storage locker would be appropriate for your unique application. CSI suggests that you utilize our professional installers for your locker installation. A storage locker installation can be a demanding task depending upon the type of storage locker, the configuration, the location, and if the storage locker comes pre-assembled or not. Our professional installers are up to the task of delivering a finished product which meets the goals of your storage locker project. CSI provides storage lockers of many types. One or more will meet your unique storage locker goals. 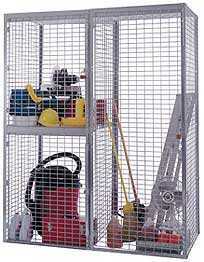 We also offer Security Cages, Tool Cribs, DEA Storage, as well as many other Safety and Security Products. If you need more space within a limited footprint to incorporate your storage locker needs consider a Structural Mezzanine. Remember our professional installers for your storage locker installation project.